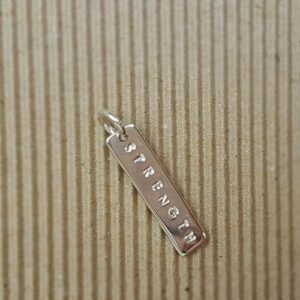 Choose from a 15mm disc or 25mm rectangle bar and have a word or name of your choice forever hand stamped into the sterling silver. Both designs are large enough to make an impact, but small enough to be cherished. The charms are amazing on their own, or paired with an initial or symbol charm. Whatever you decide, a fabulous addition to your inspirational necklace. What name will you choose? Partner, child, grandchild, you may even decide to have more than one! Or perhaps a word resonates with you more – strength, kindness, believe, progress, dream – the sky really is the limit on this one!